Your downstairs powder room can look as special as the other rooms in your house. 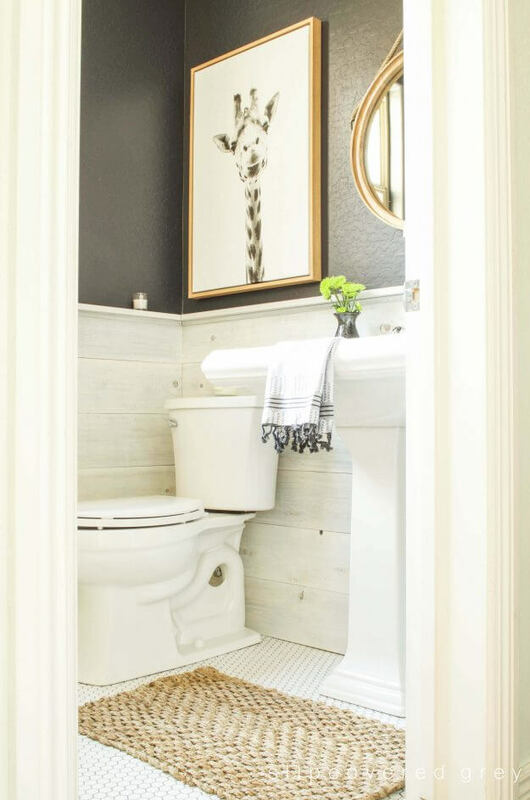 To start, realize that since your bathroom is smaller than other rooms, less is more. Start by collecting items that you would like to include, then edit your choices so that you have a cohesive collection. As you add items, be careful about adding too much and making the room feel cluttered. 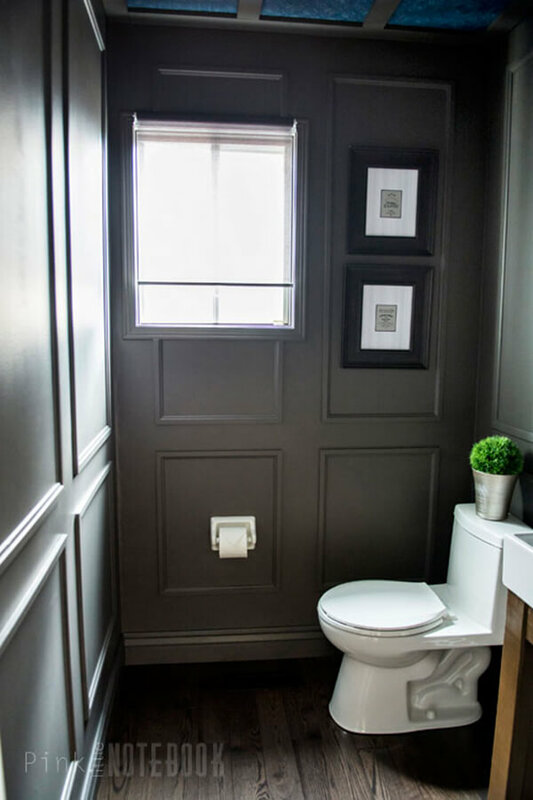 If your room has any special features such as a chair rail and wainscoting or, in an older home, an architectural feature from the past, consider how you can use it to create a unique powder room. If there is nothing in your powder room that stands out architecturally, consider how you can create a focal point in your room that will draw your collection of items together. 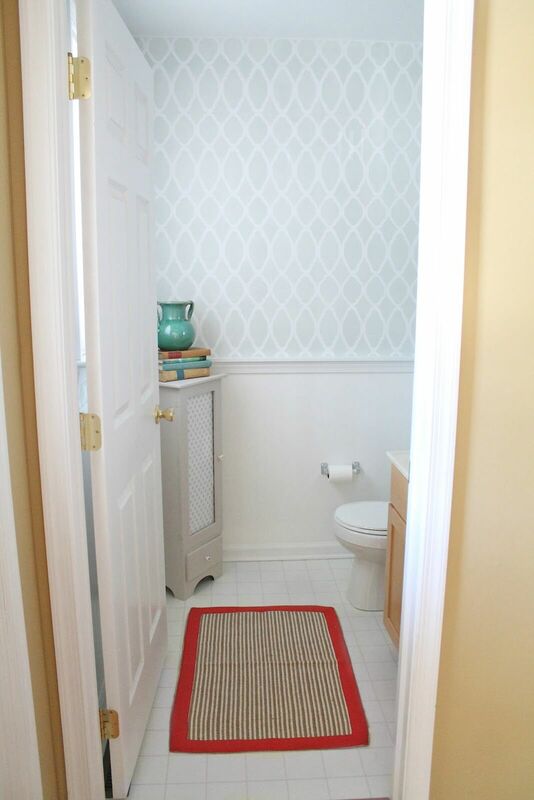 With a little planning, your powder room can be given a designer look without spending a lot. Many hardware stores have personnel who can help you with your ideas. They can suggest materials and help you learn any techniques you will need. To help you create a powder room you will be proud to show your guests, browse this collection of inspiring powder room ideas. Decorating a small half-bath so that it is more than utilitarian or same-old-same-old without overpowering it is tricky. Try adding small touches that have more impact. Start with a contrasting accent wall, and then add shelving to make space for decorative accents mixed with bathroom essentials. Mirrors help disperse light, and plants add a soothing, decorative touch. Impress with less. 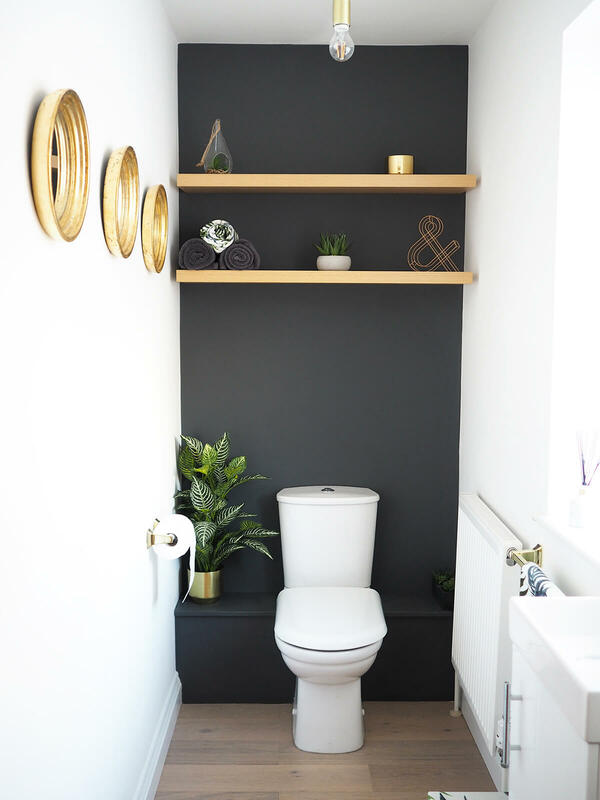 Using existing features in a room, such as the chair rail and storage space here, can provide inspiring powder room ideas. The chair rail encourages the use of a split wall treatment with one half being a focal point. Removing doors from storage spaces allows shelves to be used as functional and decorative features. 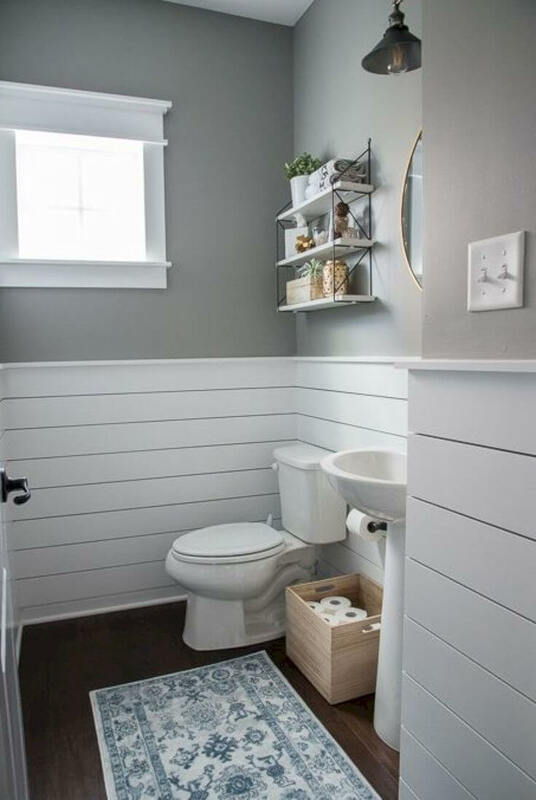 This rustic bathroom is very attractive in its simplicity with the weathered-rail wainscotting on the lower part of the wall and the painted upper wall. 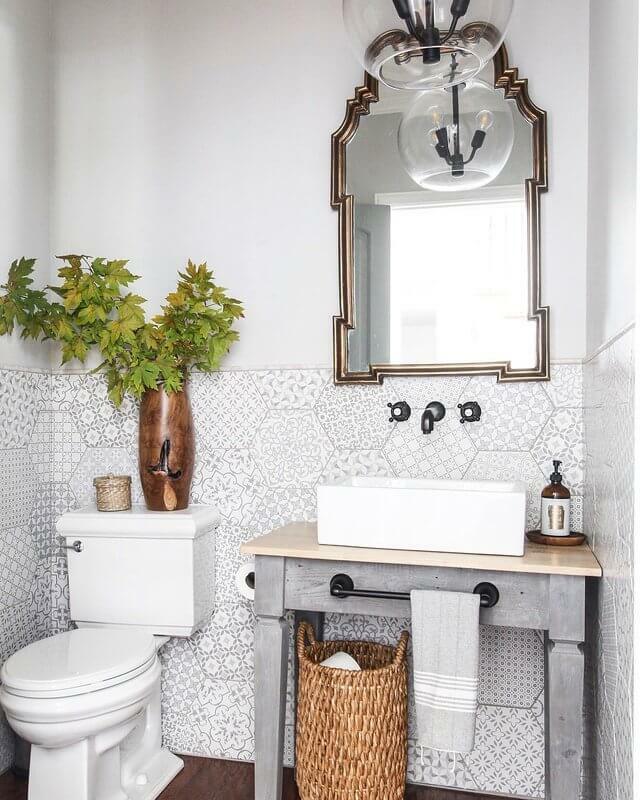 The tile floor, fixtures, and accessories complement the total look. 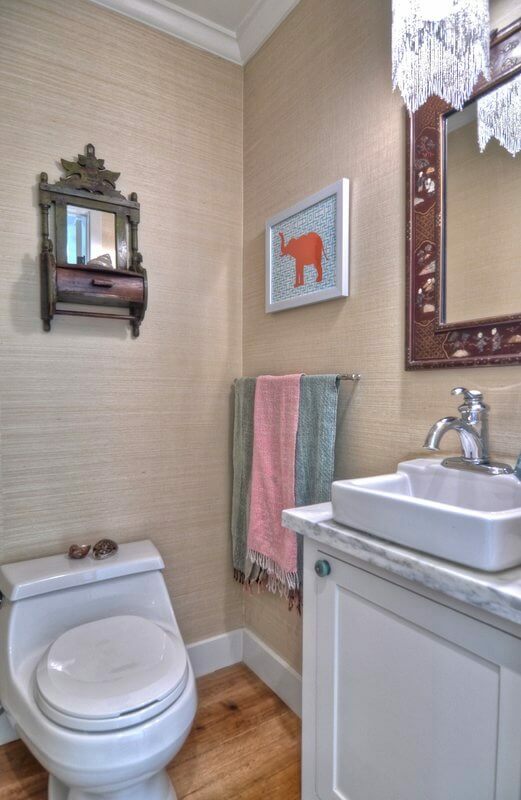 However, a couple of fun surprises, such as the giraffe picture and the ceiling treatment, prevent this bathroom from being run-of-the-mill. Inspiring powder room ideas come from creating a collection of items and building a plan. However, as you proceed, some items will be replaced by other items, as happened with this bathroom. 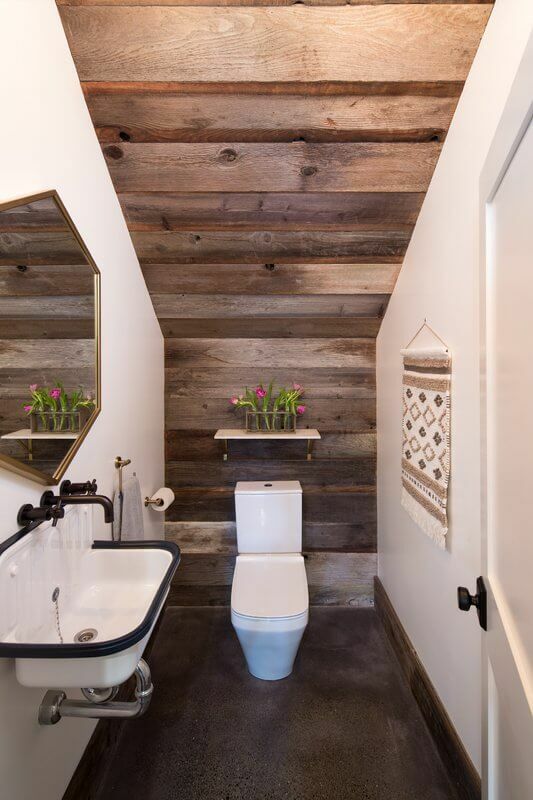 This creates a coordinated room, such as this rustic bathroom that has the look of a ship captain’s cabin from the 19th century. 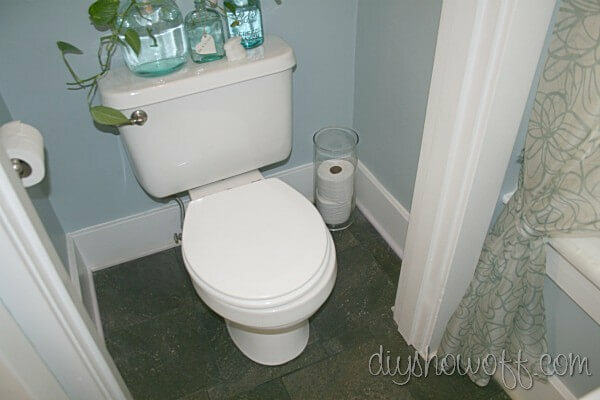 Sophisticated powder room ideas can be easy and inexpensive. Using simple molding and paint creates a special wall treatment. Painted, textured wallpaper creates a ceiling treatment. Simple inexpensive ideas and materials like these can help you create your own designer bathroom. For help, just take your ideas to a hardware store. 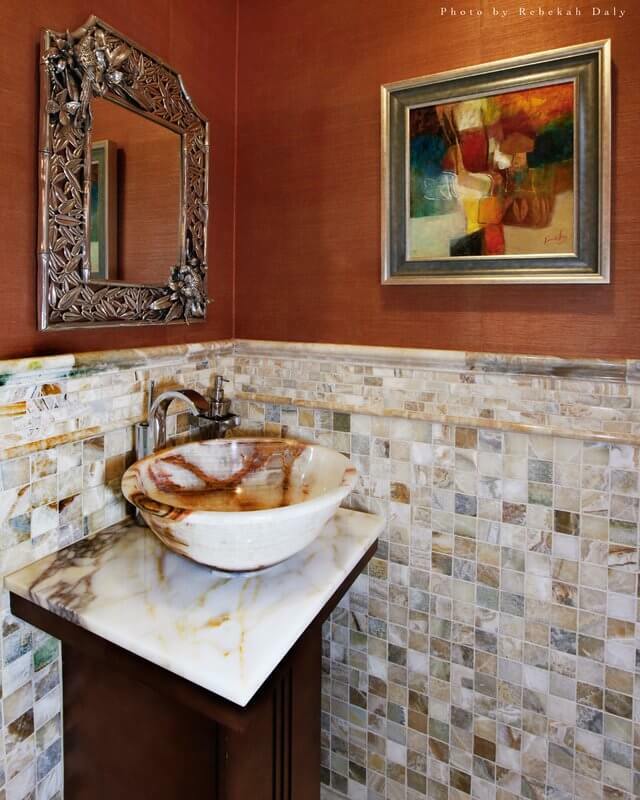 You don’t have to change everything to create a more upscale powder room. Changing wall treatments on one or all the walls will add style to your room. Use wallpaper, stencils, or paint and painter’s tape to help you add designs to your wall. 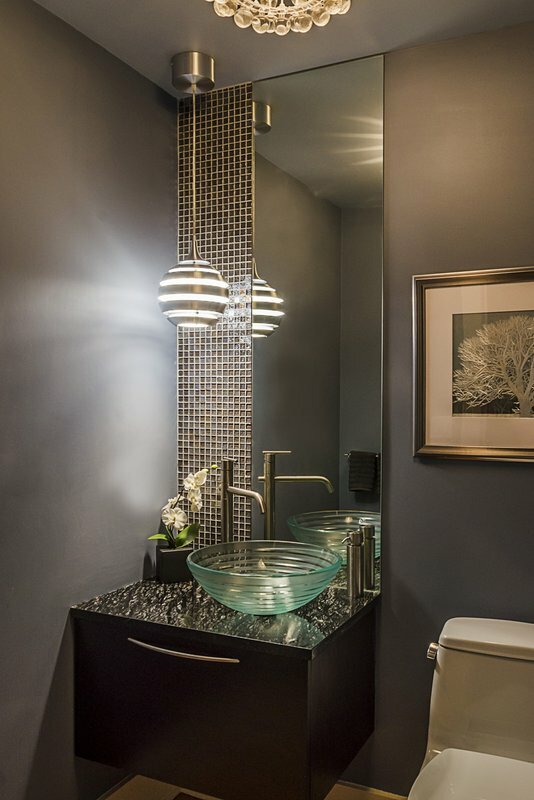 Then, changing your vanity countertop, faucet, and lighting fixture can help create the designer look you want. If you wish to make a lot of changes but you don’t have the time or the budget to do them all at once, create a plan to make the changes in stages. Make the critical changes and the changes that will make the greatest improvement first, such as a faucet that is in bad shape or a wall treatment that will greatly improve the look of the powder room. Items like vanities can be painted, and then replaced later. 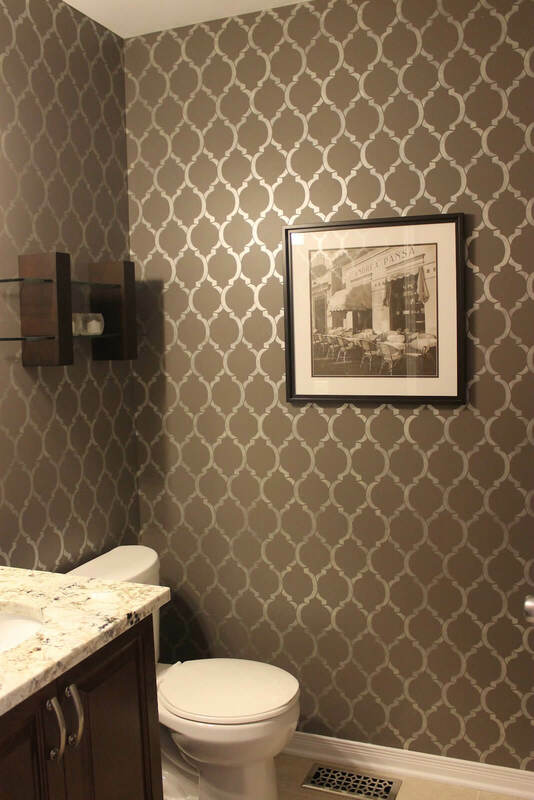 Unless your brand new home was custom built for you, the powder room will have generic features. Making changes will give it a less sterile, more personal and stylish look. The wall treatment is most likely the first change you will want to make. Then you can change fixtures and mirrors. This will create a powder room that is a better reflection of you. 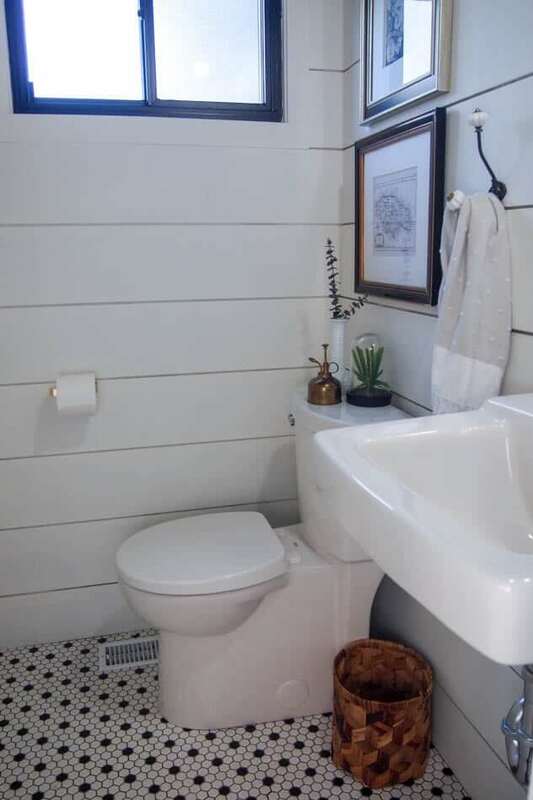 Although it’s tempting to remodel and modernize a bathroom in an old house, just updating it and leaving evidence of the changes in the house adds character, such as this bathroom’s conversion from the closet to a water closet. For example, the door to the original closet was removed, but the door frame and the evidence of the original hinges were left. The white and silver accessories give this powder room a crisp, modern feel. 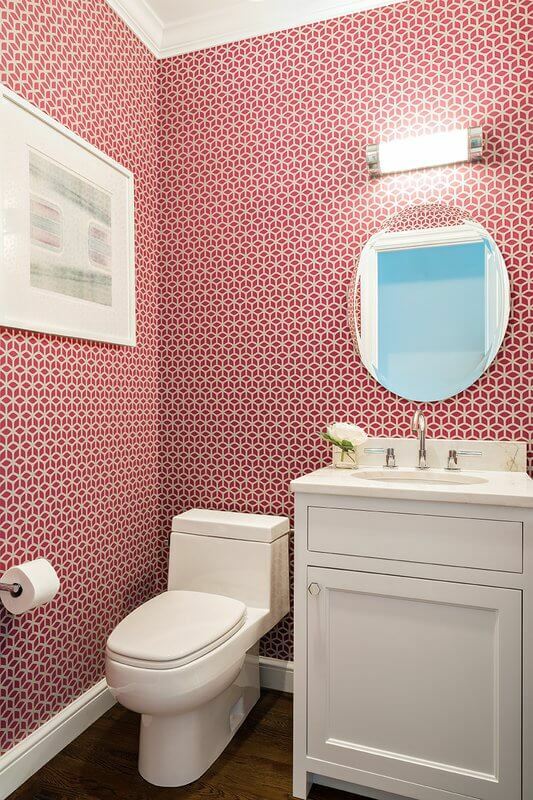 The red and white patterned wallpaper and the style of the vanity also give a traditional decor appearance. With wallpaper this bold you can keep the accessories simple and monochromatic. The wood floors contrast beautifully with the white and make it pop even more. A simple, neutral color palette of white, gray, black and copper looks striking in this combination. Glossy gray tile in a chevron pattern provides a unique accent wall. 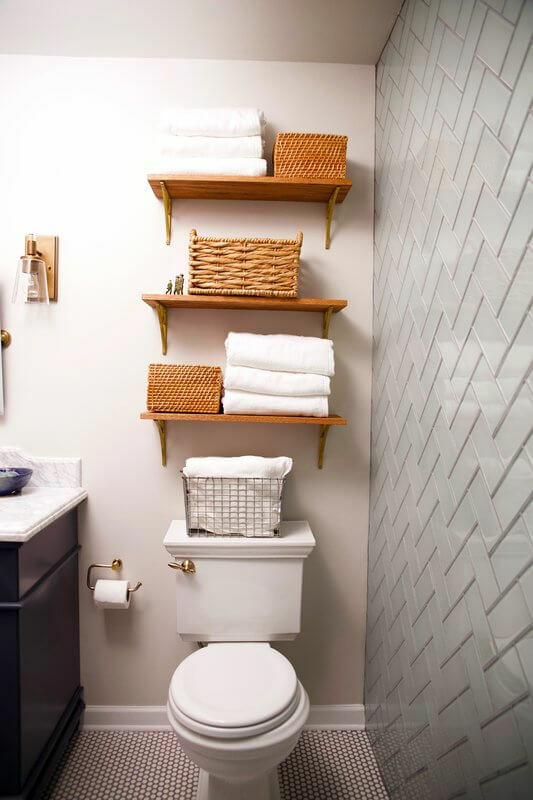 Floating shelves hold natural fiber baskets and fluffy white towels for efficient, attractive storage. The color of the baskets compliments the copper accessories and contrasts the otherwise subdued color scheme. It’s easy for coastal motifs to be a little on the nose. Incorporating some simple ocean-inspired elements into traditional modern decor can keep your coastal motif classy and fresh. 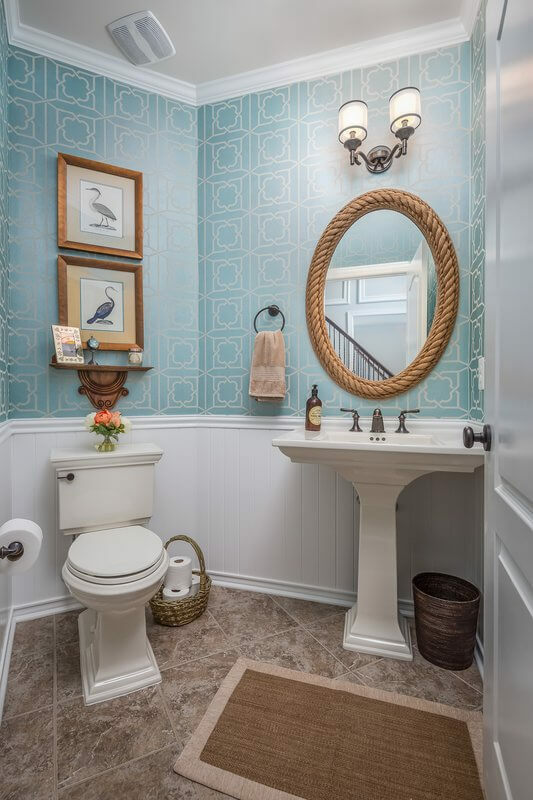 Ocean blue trellis-patterned wallpaper, a rope-wrapped accent mirror, and framed prints of water birds compliment stately fixtures and crisp white molding. 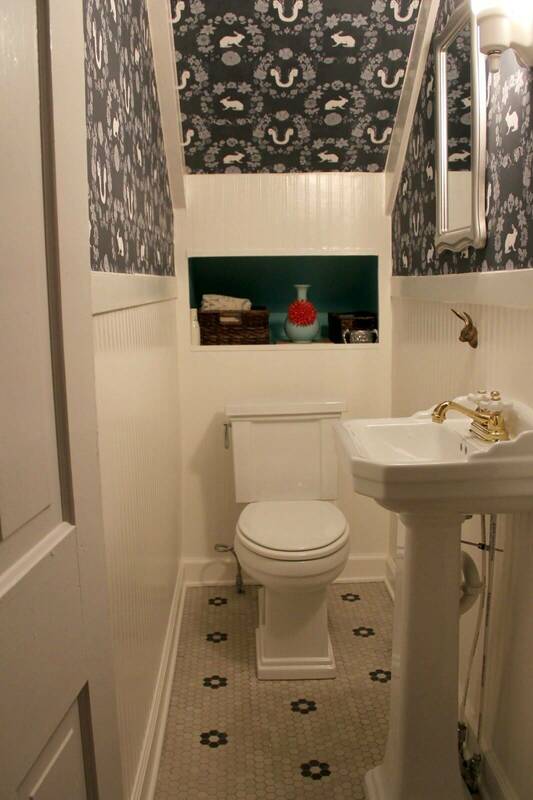 A small space like a water closet can still be chic! Play with kitschy and colorful patterns since they won’t overwhelm like they can in a larger room. 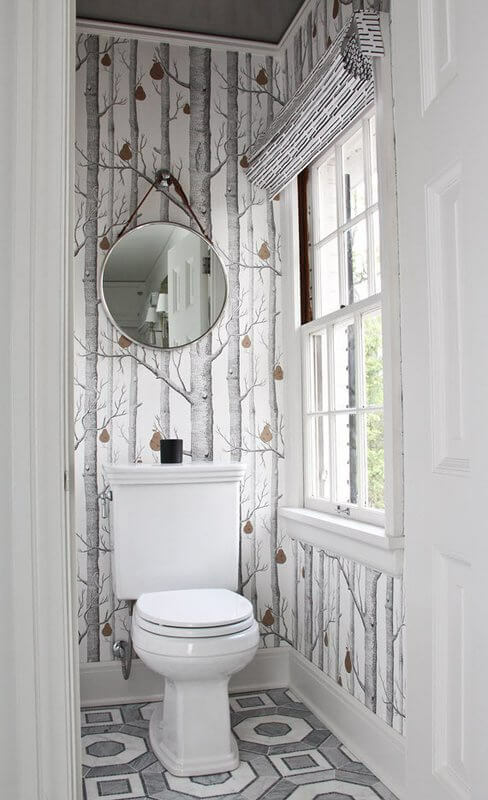 This design incorporates beautiful birch tree peel-and-stick wallpaper (for easy installation), gorgeous Amoud cement tile in a geometric pattern, and a handsome circular wall mirror with a rust brown ribbon. This design is warm and opulent. The matte gray wall color and dark chestnut vanity set create a sumptuous canvas for many decorative elements. The brushed metallic fixtures match the gold picture frame. The light pendant and ceiling fixture cast unique patterns of light that are beautifully reflected by the tempered glass oval vessel sink and mosaic tile. Combining shabby chic, glam, and rustic themes into one small space sounds like a challenge, but this arrangement pulls it off! Plain white walls are more interesting with a half-wall of porcelain patterned tile. Natural elements like the oversized seagrass basket and wooden vase provide a burst of warm color. Cast iron fixtures and an opulent art nouveau mirror pull it all together. You can prevent location based themes from feeling too kitschy by adopting a minimalist approach. The exposed wood does most of the talking in this room. A simple wall hanging and antique style basin sink evoke the southwestern vibe. Everything else from the hexagon wall mirror to the floating shelf with a metal and glass jointed vase is minimalist and chic. With a neutral backdrop of hardwood floors, tan distressed wallpaper, and a white molding and appliances, you can mix plenty of personality into the rest of the decor. This design incorporates framed graphic art, a framed mirror, an antique curio, and a statement pendant light fixture. The result is a design that’s full of unmistakably personal style. The dark wooden vanity is topped with a gorgeous marble slab and sink. The wall is half-tiled with a mosaic of shell-like colors and a tiled molding to match. The wall color is burnt umber with a golden sheen. The opulent frame around the mirror is a work of art in itself, and the framed painting ties together every color in the space.